Painter Margaret McCann has a complicated mind. I found that out for myself earlier this year when I interviewed her via phone and email while writing a catalog for her recent exhibition "From Rome to Atlantic City." As Brett Baker pointed out when he interviewed McCann for Painter's Table Margaret has an "encyclopedic knowledge of the tradition of painting" and when I spoke to her it was clear that she is also interested in pop culture, Italian culture (she lived there for eight years), film, politics, science... well the list just goes on. 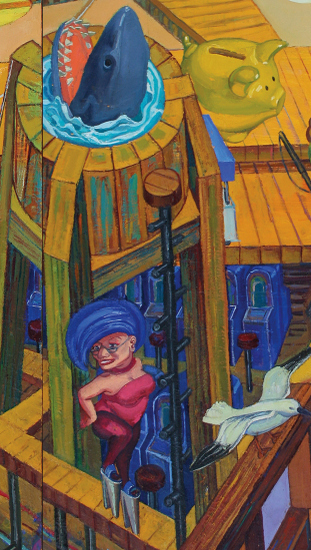 McCann's 2000 self-portrait, "Do I Dare," in which the artist sports a crazy coiffure that includes the Guggenheim Museum and the Statue of Liberty's crown, is her own way of humorously commenting on her busy mind's spiraling curiosity and tendency to fuse references. Getting to know Margaret and her paintings was Faustian: the more I learned the curious I became. In particular, as I wrote about her large three panel painting "What We Worry?" which is set on the boardwalk of Atlantic City -- re-imagined, re-configured and re-populated in Margaret's mind -- I began to wonder about the meanings and associations of the many pop culture characters she had included. "McCann has a mind like a tarot deck," I wrote in my essay, "jammed with meaningful characters that spill out onto her canvasses in eccentric troupes." In her personal vision of Atlantic City she uses these characters as a kind of "American 'commedia dell'arte' troupe" that together form a loving caricature of American culture. Atlantic City is surreal, like a 3D collage, lots of contradictory things going on in a small space; hence I've painted the boardwalk in a cubistic Piranesi-prisonesque way. In Rome Piranesi's prints of monuments are everywhere, and for decades I've had students copy one of his crazy prisons: a great way to have them address measuring, texture, and atmospheric perspective. Over time Atlantic City became to me a kind of anti-Rome, all about levity and the ephemeral, so different from the gravity of the Eternal City. 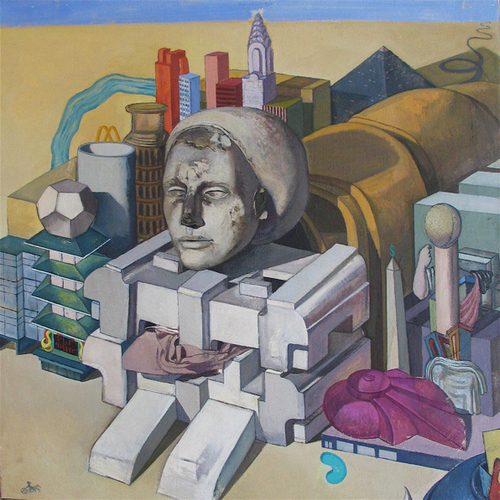 "Sphinx" expresses these kinds of contrasts; it was begun in Rome and finished in Portsmouth, NH, where I added Las Vegas references, and then a few years later I wound up moving to Las Vegas' prototype, Atlantic City. Atlantic City was badly damaged by Sandy, but the aerial view initially shown on TV looked more devastated than it was; it already had an empty Antonioni-like quality, which the film The King of Marvin Gardens captures beautifully. The first time I visited as an adult, its north end (where I wound up living) reminded me of Palermo; the view from my balcony resembled an early Boccioni self-portrait. But there is a lot of humor too. I regularly encounter R. Crumb-like scenes: a singing bartender, a dangling nose earring, a policeman talking to people waiting for the bus about his pedicure treatments, etc. 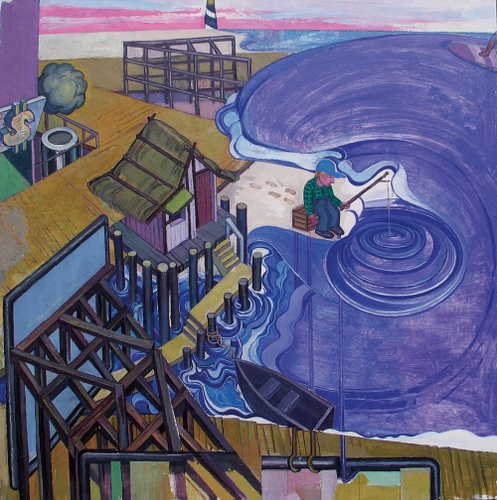 The fisherman in "Fishing Hole" is modified from an R. Crumb calendar. I've painted giants and myself as a giant in my 'headworks' series, so painting myself diminutively in size and age, playing the jester, is a look through the other end of the telescope. My favorite insertion of a miniature self-portrait is seated at the bar in Ballys "Mountain Bar," drinking coffee and perusing a Cezanne painting of Mont Sainte Victoire; I might have actually done that if the gambling tablets on the counter wouldn't have been in the way. I started painting myself as a convict several years ago. I thought it was funny not just because of the image, and puns regarding artistic conviction, but formally -- it spoofs concentric drawing technique, and simplifies planar structure enjoyably. The strong value contrasts automatically engage the picture plane as well -- that's why these zany outfits are used; they're anti-camouflage, visually pop forward. In "What We Worry?" 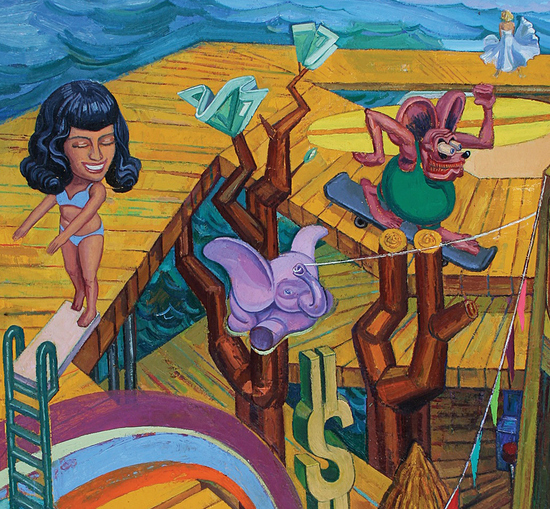 Dumbo flies between a money sign from the casino below and some money trees growing out of the planks of the Boardwalk. To the right is the always-exuberant Rat Fink, another childhood fixture, riding a skateboard and carrying a surfboard -- people do that searching for waves along the boardwalk (though now since so much sand was added to the beach around the Garden Pier some surfing spots like "Crystals" may be defunct). Seeing Dumbo on the Walt Disney TV show, I recall being mesmerized by the psychodrama, magic, and especially the flying scenes, and how fantastically tall the tree Dumbo flew up to was. I found a copy of the book in grad school and used that extreme space in my "Self-Portrait as St. Sebastian," which by the way is in storage in Atlantic City now. The storage facility is very futuristic looking, adjacent to the wind turbines but right off the part of the Whitehorse Pike torn apart by Sandy: I still have check if my stuff survived. I put a kite in Dumbo's trunk instead of a feather. L to R: Betty Page, Dumbo and Ratfink, a detail of "What We Worry?" That's Betty Page (though doesn't look much like her) diving off a high board into a small pool -- inspired by another iconic childhood cartoon image, though it also references Atlantic City's famed "diving horse". Recently a club opened by that name with a sharp-looking diver graphic, but they eventually replaced it with the usual photographic close-up sign of dancing girls -- I guess they had to make it more lowbrow for business reasons. When I lived there it was awkward to occasionally pass prostitutes on the street, not in bad neighborhoods but near the corner store -- do you acknowledge them? Obviously the injustice of it is disturbing -- should you try to save them? Atlantic City is friendly, and it would have been rude to look away. I put Marilyn in the background with her dress blown up by the wave, not realizing the danger but also playing to the ocean, as most of the marquees along the boardwalk seem to -- and a rainbow threading its way through the entire image, partly to hold it together. 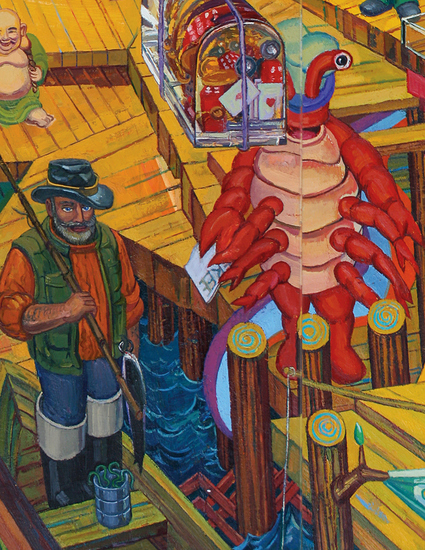 The Fisherman and the Lobster, a detail of "What We Worry?" I bought the fisherman statuette at a drug store; I was struck by his elegant stillness, and amused by his indeterminate ethnicity - he looks spray-tanned. He has a "can of worms" (another corny pun). 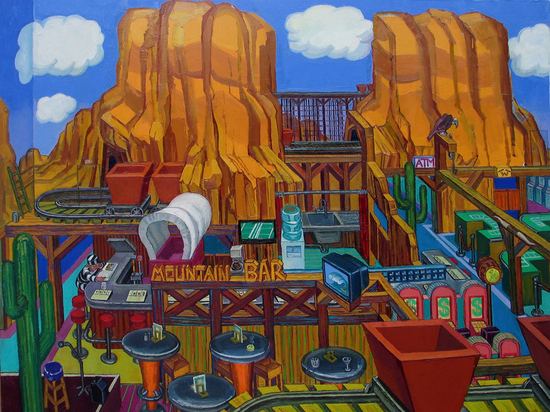 It was hard to get the foreground to work in this painting because so much of it contains the deeper space of the subterranean casino. I finally resolved it by adding the billboard with a seagull on it, which pulls out front. I love cheap but well-sculpted figurines. The really bizarre ones -- like a Dalmatian in a pink bikini sitting on a garbage can and drinking a beer, it might be a cell-phone holder -- can make your head spin... who in what country thought this would be the kind of product an American would buy for 99 cents, and how did they conclude that? How many were produced and at what cost? What a crazy world. The Lobsterman is from a photo I took of someone handing out flyers for a restaurant near the Pier Mall on the boardwalk -- we joked around in a "mime" kind of way. In front of him a giant riches-filled paperweight is being lowered into the fisherman's boat. I've been interested in scale dislocations since living in Rome, especially from teaching a class called "Drawing Monuments" for Trinity College -- we'd draw Constantine's giant foot off of Michelangelo's Campidoglio, which as an American reminded me of Claus Oldenburg before it made me think of the history of the personage it belonged to. You become very aware of your postmodern reactions when you spend a long time in a culture possessing a deep history. 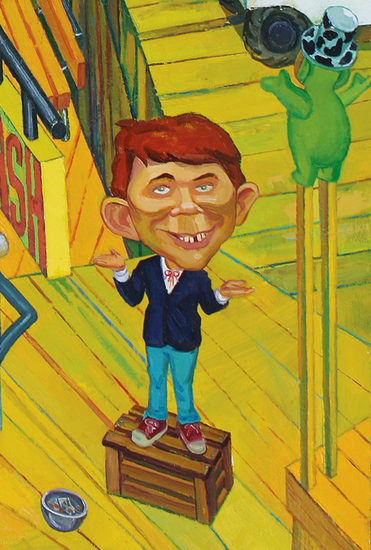 Alfred E. Neumann, a detail of "What We Worry?" 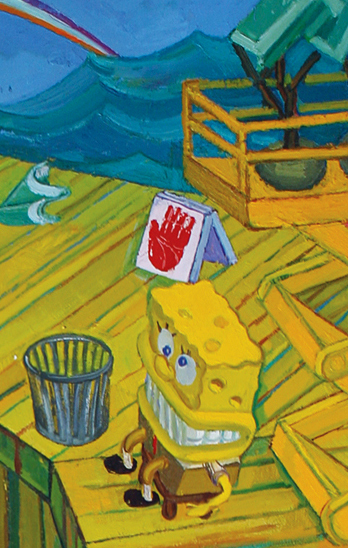 SpongeBob, a detail of "What We Worry?" Regarding Alfred and Bob... what can I say about them that hasn't already been said in a thousand pop songs? The insanity of their optimism is apparent even to a child; both engage childhood's initial awareness of irony. Alfred is on a soapbox competing with a Teletubby for an audience. I've seen odd side shows on the boardwalk -- not like the high quality shows you see on the street in NYC, more like some subway performers in their lack of polish. The difference is it's easy to see the financial need of performers in the subway, but on the sunny stage of the boardwalk it looks more like performance art, especially when they're very low-key. A regular fixture is a woman who sings gospel songs out of tune but very passionately; she's not looking for money but will grasp your hand and say a prayer for you if you address her. SpongeBob is sitting near a trash can, money trees ready to be planted, and a psychic's placard; it's amusing to see psychics sitting in front of their kiosks talking on cell phones. 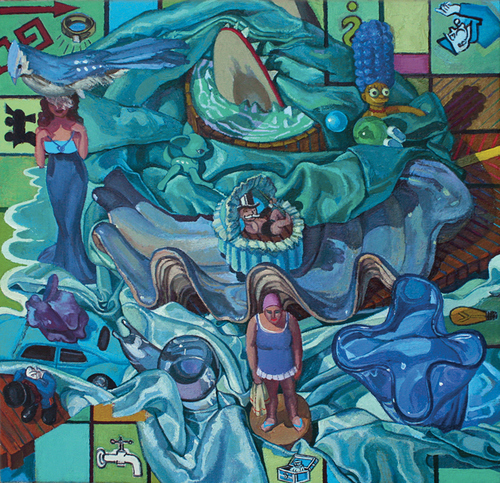 The Shark, The Piggybank and the Old Lady, a detail of "What We Worry?" I found the shark toy at Goodwill and have gotten a lot of mileage out of it, one of those things that are always fun to paint. There's a tiny jumping-off platform in front of it, a piggybank with a dumb look on its face on the boardwalk behind, and a foxy old lady with blue hair in platform shoes strutting her stuff in front (the actual statuette is amazing). When I first moved to AC the vulgarity was striking and pathetic, especially old people playing slots. But after a while I could understand why seniors would be drawn to it: casinos are friendly, colorful places with cheerfully chiming machines, where they can move around freely and safely -- though many "Q-tips" scoot around not just inside the casinos and on the boardwalk, but all over town, obviously feeling very much at home. The Convict, a detail of "What We Worry?" 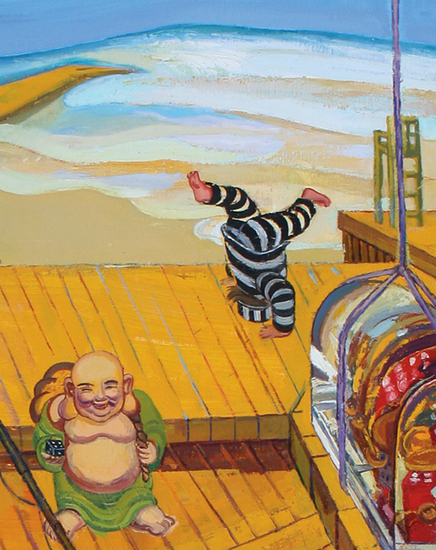 There on the right I'm doing a flip -- if I would I could -- near a smiling Buddha holding a die, and an abandoned lifeguard chair; s/he presumably fled at the sight of the oncoming tsunami, but I don't seem concerned -- like Alfred says, "What we worry?"